When most people think of self sufficiency they think of seeds, garden tools and canning jars but there is a lot more to consider. Being self sufficient also means you must build and fix things yourself to a large degree. It is easy today to take your problems to someone else and have them fix them for a fee but the day may come when you either cannot find someone to do the work or you cannot afford to pay them for the work. True self sufficiency means you must become a jack of all trades to get by with the least expense. A few weeks ago I had a flat tire on one of the trucks. When I went to inflate it I discovered the problem was a broken valve stem. Under normal circumstances this would require a trip to the local garage. In my case, I simply removed the wheel from the truck, put it on my manual tire changer and broke the bead. Then I looked through my cabinet of small repair parts and pulled out a new valve stem. I removed the broken stem, inserted the new stem with my valve stem puller and re-inflated the tire and put it back on the truck. This all took about half an hour. A major problem was reduced to a minor inconvenience. Just this week I rebuilt the carburetor on another truck. When something you need is broken you can either replace it or fix it. Fixing it will require knowledge and parts provided by you or someone else. If someone else does it that is going to cost you. Have you ever noticed that someone else’s time is always more expensive than your time? To pay for this repair you will have to earn money to pay for it. Money is usually harder to come by these days than time so fixing it yourself is usually the preferred method if you have the skills and tools. Over the years I have had various jobs that allowed me to build up a variety of tools. I have a good mechanics tool box with many specialty tools. I have carpentry tools and basic garden tools. I even have a hydraulic press to make hydraulic hoses. I have soldering guns, a mig welder and even a tube tester to fix old radios and TV’s. I don’t mention these to brag but to make a point. Not only do I have tools and knowledge to aid in becoming self sufficient but I also have resources to use for trade with others should it become necessary. If you are self sufficient or on the way to it you will likely have a number of tools and machines to aid you in daily activities. If one or more of these machines becomes inoperable, can you fix it? If you are cut off from normal repair facilities you will either have to fix it somehow or do without. Nobody can do everything but the more you can do the more self sufficient you will actually be. Being self sufficient means having knowledge, tools and repair parts. Knowledge can be procured or from your library of technical and repair manuals. Tools will likely be limited to your capabilities but looking ahead and buying specialty tools for future use is always encouraged. Repair parts are one area that few people think about until it is too late. Fixing a leaky faucet is simple unless you do not have a new washer to put in. In a national or worldwide crisis, you may not have the ability to run down to the local hardware store and buy the parts you need so you need to think ahead and store some of those small inexpensive parts now while they are cheap and plentiful. I had to order the carb rebuild kit I needed but in a crisis I might not be able to do that so I may stock an extra one for future use now that I’m thinking about it. Even if I don’t use it I may be able to sell or trade it to someone in the future that is desperate for one. When you think of self sufficiency you need to think about all of the little things that can cause things to come to a sudden halt for want of a few small parts. Simply having some selected parts in stock as well as things such as tape, glue, solder, JB Weld, grease or oil can make future problems much smaller. Look at all of the things you depend on and study them one at a time to determine what might break on them and make a list of parts you might want to keep on hand. One thing I find handy are the little boxes of parts such as cotter pins, fuses, roll pins and springs that I bought from Harbor Freight. I may only open those boxes once a year but when I need a small part that broke, it saves me much time and money being able to fix it on the spot. That carb I fixed needed a new return spring and I had one in one of those boxes. A screw also broke off in that carb and I had to drill it out fill the hole and retap it. I did that without having to leave the house and that carb works great now. The more you work around the house the easier it is to acquire these skills and tools. Someone who depends on others to do these jobs now will find it difficult to plan ahead for the day when they must do it themselves. The best time to start learning is today while you still have time to get the knowledge, tools and parts while they are still available. For those of us who can only afford old worn out equipment, it is second nature to learn how to fix it yourself. Being rich has it’s advantages but being poor also has some advantages that you may not think of until all of your resources are cut off for some reason. The ability to do it yourself in the good times will likely save you in the bad times when self sufficiency is forced on you and not just an idea you think about on your long commute home. 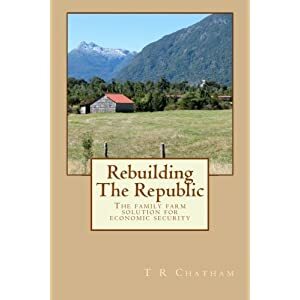 The road to recovery from any type of societal collapse is largely dependent on the mechanism that caused the collapse. For this reason we need to determine what the likely cause of the collapse will be and have the appropriate equipment to fix the malfunction after it happens. This requires society to take a realistic look at the situation as it is and not how we want it to be. Most people do not even realize that we are heading for an economic collapse of epic proportions so talking about recovery may seem like we are getting too far ahead of ourselves. What you need to understand is that what we do now, before the collapse will determine how well we are able to recover from it and how fast. When you leave on a trip you pack the appropriate clothing and make sure the car is running well and you have emergency equipment like a spare tire with you just in case. When the economy collapses if we do not have the proper emergency equipment on hand to fix the problems, we will find ourselves stranded and unable to move anywhere. From a societal standpoint, being unable to move means we will not be able to resolve any of our problems quickly and will out of necessity begin to prey on one another to fulfill our needs. This is what will cause loss of life on a monumental scale as the crisis is drawn out over time. Having the proper emergency equipment and a plan to use it will greatly reduce the suffering that is endured by society. This does not mean there will be no pain, only that we can keep it manageable. A nations wealth is derived from having a product to sell. A service economy is dependent on having a wealthy society that has sufficient disposable income to support service jobs that consumers pay for rather than doing the jobs themselves. A society cannot get wealthy by washing each others clothes. There must be some type of real production to generate true wealth. For this reason, the type of collapse many western nations now face will require them to have the ability to actually produce real goods following any collapse to begin the generation of wealth that is required to lift society out of any depression. This means society will need those with insight to have the necessary emergency equipment standing by after the collapse to begin the production of real goods and provide people with real jobs. The lack of jobs and resources following any collapse will mean poverty and predatory actions by society when things finally bottom out. Most of the manufacturing ability of America has been shipped overseas. This means when a collapse occurs here we will once again need the ability to produce those things we need because we will lack the ability to buy them from others. The lack of a functional manufacturing sector means we will suffer in the future if we do not set aside the necessary emergency equipment we will need in the future to restart our manufacturing ability. As with many things we will need equipment to produce other equipment to build up that ability. The lack of this basic equipment to rebuild that manufacturing ability will doom this nation to poverty and third world status for decades to come. This does not necessarily mean we will need to build large factories with thousands of employees. We will likely need to focus on smaller mini manufacturing sites employing a few dozen people in each. This is a first step to building larger more productive factories in the future. .
China has embarked on a building spree over the past decade and the result is the existence of many ghost cities and new infrastructure all over China. They possess all of the manufacturing technology of the west and the factories to produce the goods. They have also sought to secure raw materials all over the world for future use. They have built up a huge stockpile of gold. All of this means that China has positioned itself to have the necessary infrastructure to recover from any collapse that the world may face in the future. They have the equipment to build their own wealthy middleclass to fuel their rise in the future. They will do what the U.S. did in the 20th century and build up a wealthy middleclass and become a world leader economically, militarily and politically. Americans need to realize that China now owns vital ports and businesses in the U.S. Following an economic collapse China will be in the position to increase its manufacturing ability in the U.S. and smother any American attempt to rebuild its own manufacturing ability making it independent of foreign influence. This is the threat to America recovering any future collapse if we do not have a large number of independent operators that can rebuild manufacturing ability at the local level quickly following any serious event. If America wishes to remain free, we need people with vision to prepare for this eventuality and be able to respond with a new program of production to counter the many dangers we will face in the future. There are two areas that should be concentrated on as far as production is concerned. The first is the extraction or harvesting of resources and raw materials. The second is the conversion of those raw materials into finished goods. Once you lose the ability to work and earn a living you become a government serf that is forced to bend to their will as you ask for handouts to survive. In an economic collapse the medium of exchange is destroyed along with the savings of the masses. When this happens people can no longer buy the goods they need to survive. Two of the things that survive collapse are individual labor and raw materials. When you can combine these with a third item, production equipment, you have the means to provide the basics of survival for the people and a means to produce their way through the difficulties they are facing. Absent a medium of exchange people will still be able to work for the things they need. This is the key to overcoming a serious crisis that can fracture the population and destroy societies. Small localized production can make all of the difference when goods are needed to sustain families at the most basic level. The basis of any society is the ability to produce agricultural products. Food is a basic necessity and is the basis of any prosperous society. It is the first level in any production scheme to provide basic goods. Food provides the means to support industrial production. Industrial workers earn pay so they can buy food for their families. Food becomes the primary trade item to support other types of production that eventually provides a higher standard of living for society. In a collapse, a food producer with a small industrial facility can trade food for the labor to produce factory goods that provide value added goods for society he can trade for other items. With this type of production, a community can overcome economic obstacles even in the absence of a medium of exchange. The industrial equipment could be as simple as a portable saw mill, a grain mill, fiber processing machines such as a spinning wheel and floor loom or a shop filled with wood working or metal working machines. The size and scope of production will be dependent on the abilities of these forward looking individuals to procure these machines prior to any crisis. This may seem like pie in the sky dreaming to some but the fact remains. The future will only be as difficult as we make it. If we fail to prepare then we are preparing to fail and that will cause suffering on an unimaginable scale yet to be seen. Even a small amount of preparing can yield huge dividends when the time comes so anything you can do to prepare for the changes to come will be worthwhile. I am a big believer in infrastructure and the benefits it brings with it. A farm with specialized equipment can produce more products and create more wealth than one with typical farm equipment. Someone raising livestock that sets up their own small processing facility can process their meat for increased worth and has the means to hire persons to do the work for payment in food products. A dairy that has the ability to produce cheese can increase their product line and produce a product that will keep longer. When crisis strikes in the future the amount of infrastructure available at the local level will determine what hardships we will face. The production of real goods is the only way we will get through a future crisis and keep society in tact for the duration. The wealth of local communities will depend on what products they have to offer in the future. A lack of local production will end with poverty and societal breakdown that may not be recoverable for many years to come.